What is an API? It’s the acronym for “Application Programming Interface” and it has great value once you understand what it is and how it works. Many have seen the term (API) around for quite some time, but figured it’s just some techno-jargon that means nothing or adds no value to those of us on the RE Net. WRONG! One thing I have learned over the years is that even if you don’t understand some things, you should still know of them or at least about them, right? I see some of you shaking your head “yes” right now. To keep this post about API simple and easy to understand, I’ll just put it this way; adding an Application Programming Interface (API) to your site can add powerful and useful information to your traffic and visitors and it requires less work than you may think. By incorporating an API into your site, you can deliver data and gather information all at the same time. An API can benefit you and your readers by providing them with valuable inter-active data and information. You’ll get customers, not filled in forms, brand recognition and best of all, it’s FREE! 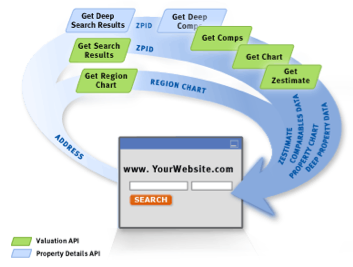 Why Integrate with Zillow’s Data using API, would likely be the first question you’re be asking yourself right now? One thought is that if sites like Yahoo.com and Education.com Integrate our API, why wouldn’t you consider it as well? Not everyone will be able to do this, but as for the Implementation and Requirements, everyone could do this if they wanted to. I had no idea how powerful an API could be until I researched it a bit, and that’s why I’m sharing this with you. Take a few moments to understand what API is, how it works, why it could add value and growth to your site and business, then let me know if you’d like to take Zillow’s API to the next level on your site. If you’re comfortable working with an API and incorporating into your site, that’s awesome. If not, I’ve seen what companies like Z57 and Diverse Solutions can do for Real Estate Business sites and would be happy to put you in contact with the individuals who can assist you if needed. These took me a while to research and find so I hope you’ll take a moment to really look at these well known sites that use/deliver API to bring value to their clients and visitors. Those clients and visitors being YOU and I. Last.fm , EBay, Facebook, Feedburner, (now @Google) Windows LIVE, DIGG, Delicious, Google Maps, Flickr, Twitter, Yahoo, and Zillow! Here are some other samples of what an API looks like on a “LIVE” site and from the users perspective: Yahoo Real Estate, Manage My Life, Public School Review, and IDX Central. To get started using a Zillow API, you’ll need to 1. create an account on Zillow, (only if you don’t have one already) 2. Get a (ZWSID) web services ID, then 3. Take a look at our Developers Guide to get instructions on which data API will best suit you and your sites needs.